Skateboard protective gear, skateboard wrist guards for hand, thumb, wrist and forearm protection for the most common skateboard injury. Check out AllsportProtection's selection of skateboard protective gear and skateboard wrist guards with Protec, SixSixOne and Poorboy for all your skateboard wrist guards and skateboard protective gear needs. Choosing the best skateboard wrist guards can sometimes be challenging. Call and chat with one of our Service Pros at 800-766-7269. 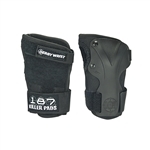 They can help you figure out which skateboard wrist guards or other piece of protective gear will suit you best. Learn more by taking a look at our Protection Blog.